One of the things that I've really loved about this column is getting a sense of how connected everyone was. Truly, everyone seemed to know one another, even as small groups formed around certain editors. A case in point, over the last couple of columns, I've been looking at the Golden Age of SF, which is generally regarded as beginning with John W. Campbell Jr.'s rein at Astounding. Campbell's star was bright and enduring, but it lost its innovative edge. H.L. Gold, I think, deserves more attention for his role during the Golden Age, as his magazine Galaxy Science Fiction provided some of the genre's most enduring classics. Go read Changing the Playing Field: H.L. Gold & Galaxy Science Fiction over on Kirkus Reviews! Alternate Worlds, James Gunn: Gunn's book has a particularly good section on Galaxy and Gold's influence during the Golden Age of SF. A Pictorial History of Science Fiction, David Kyle: This book has an excellent analysis of the importance of Gold and his work at Galaxy, giving me some very good information on how he impacted the genre. New Maps of Hell, Kingsley Amis: Amis provides some good information about Galaxy and Gold. 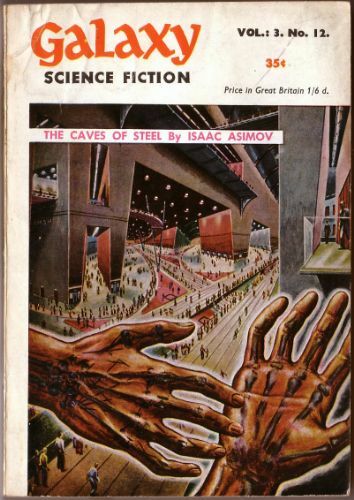 Billion Year Spree, Brian Aldiss: Galaxy gets a brief mention here, chiefly in context of Alfred Bester. Seekers of Tomorrow, Sam Moskowitz: Moskowitz provides some good early biographical information on the beginnings of Galaxy Magazine, and Gold's involvement with various authors. The Way the Future Was: A Memoir, Frederik Pohl: Pohl took over for Gold in 1961, and this book details his dealings with the man, as well as Gold's final days in the editor's chair. The Futurians, Damon Knight: Knight provides some good information about Gold here. Science Fiction of the 20th Century: An Illustrated History, Frank M. Robinson: Robinson has a good, important section on the influence of Galaxy Magazine. The Creation of Tomorrow: Fifty Years of Magazine Science Fiction, Paul A. Carter: Carter details some great information on Gold and his work at Galaxy Magazine. H.L. Gold Wikipedia Entry: I almost never use Wikipedia as a primary source, but in this instance, there were references to a source that I would have otherwise used, but didn't have, which helped provide some good biographical information on Gold. Horace Gold Britannica Entry: This entry provides some good biographical information on Gold's life that I didn't find anywhere else.